Paw Print Genetics was approached by the Australian Shepherd Health & Genetics Institute (ASHGI) to conduct a pilot project on blue-eyed, tricolored (BET) Australian shepherds (Aussies) to understand whether these dogs have the SINE insertion in the PMEL gene that can cause a variety of coat color and pattern variations known as merle. Identifying whether these dogs do or do not have the merle mutation can help inform how to conduct a larger research study. The merle mutation seemed a logical place to start, as dogs with classic merle coat color patterns can have blue eyes [Clark et al., 2006]. With the help of ASHGI and several breeder volunteers, we collected 38 BET dogs that have blue eyes but no coat variations associated with carrying a copy of the merle mutation. These dogs were not randomly selected from the whole Aussie population, but rather, were sent to us from the breeder volunteers. Thus, many of the dogs collected may have been related. Paw Print Genetics recently launched a high-resolution test for merle that allows for identifying variation within the SINE insertion and allows for discrimination of the various possible merle alleles. Using this DNA sequence-based, high-resolution test, we screened the 38 BET dogs for the merle insertion. Of the 38 BET dogs tested, the majority (n=23) were “m/m” with no merle insertion variant present (non-merle). Fourteen dogs were genotypically m/M and their M allele had SINE insertions ranging from 210-242 base pairs (bp) in size. One dog was homozygous, with two copies of M, with insertion sizes of 211 bp and 223 bp (M211/M223). All of the M insertion variants identified in these BET dogs are found in “cryptic merle” dogs and are not associated with a classic merle coat color pattern. These results are potentially interesting and allow us to conclude at least two things: First, the majority of the BET dogs tested do NOT have a cryptic merle insertion which suggests that there are other genetic factors that contribute to blue eyes. This finding is not surprising as other, non-merle breeds are known to have blue eyes (for example, Siberian husky dogs). Second, the finding that some BET dogs have a cryptic merle insertion might suggest that cryptic merle mutations may be associated with blue eyes. Merle mutations are known to have variable expressivity with a variety of coat colors and patterns. Thus, it is not surprising that Aussies carrying cryptic merle mutations may or may not show blue eyes. This is just an example of variable expressivity in which dogs with the same genotype (DNA changes) may not have the same phenotype (may look different). Variable expressivity is not a new genetic concept and is found for many of the traits and diseases that are tested for in dogs. Alternatively, the finding of cryptic merle mutations in the BET dogs studied could be coincidence, as these mutations are found quite frequently in the population of dogs tested by Paw Print Genetics. 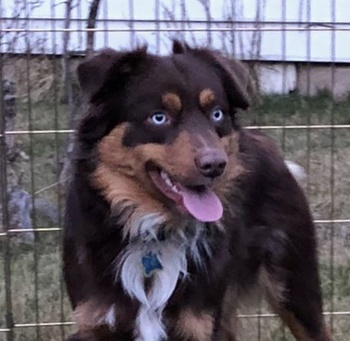 However, because many dogs with PMEL insertion mutations in the size range that produce classic merle coat patterns often have blue eyes, this makes the PMEL mutations in the cryptic merle size range an attractive candidate for further study. In addition, one must keep in mind that the dog genome contains about 20,000 genes and these genes work together in pathways, rather in isolation. Thus, the blue eye phenotype may be influenced by other genetic factors within a breed and between breeds. Therefore, a larger study of randomized, unrelated dogs with brown or blue eyes, across multiple breeds would be needed to (i) exclude or confirm cryptic merle mutations as directly associated with blue eyes and (ii) identify additional candidate genes that may contribute to blue eyes in dogs. Paw Print Genetics thanks ASHGI for suggesting the pilot project and thanks the volunteers for providing samples on their dogs. For more information about Paw Print Genetic, please visit our website. If you have questions about what tests are appropriate for your dog, you can email us or call us. Our geneticists and veterinarians provide pre-test genetic counseling before you order to help you with your questions and post-test counseling after you receive your results to answer your concerns at no charge to you. Help! I Bred Two Cream Dogs and Got an All Black Litter!